Anton's syndrome is bilateral cortical blindness with visual anosognosia and visual confabulation. The first published description of someone who was blind but denied it was that of a nobleman reported by Montaigne in the 16th century. Gabriel Anton's description of the syndrome was published in 1899 with descriptions of three patients who had visual, hearing, and motor impairments, respectively, but who denied these deficits,, Joseph François Babinski in 1914 named this phenomenon of blind hemiplegic patients who were unaware of their blindness, “anosognosia.” Although the syndrome has been named after Anton and Babinski, it had earlier been described by Wernicke in 1874 and by Westphal in 1882. Clinical diagnosis of Anton's syndrome is based on five criteria: (i) failure to blink in response to threat, (ii) loss of light and dark visual impulses, (iii) preservation of pupillary and accommodation reflexes, (iv) normal fundi, and (v) preserved extraocular movements. The absence of global cognitive deficits was central in Anton's original description of the syndrome. Hypoperfusion of the occipital cortex is the usual cause of cortical blindness. This commonly results from ischemic vascular injury but could also result from hemorrhage and various other causes, including advanced glaucoma. Cerebrovascular disease is the most common underlying etiology that is reported in association with Anton's syndrome. Damage to the visual association cortex (Brodmann area 18 and 19) and the primary visual cortex (Brodmann area 17) is responsible for cortical blindness with Anton's syndrome. The former is believed to be responsible for patients' unawareness of their visual impairment. Other authors suggest that parietal rather than occipital injury may be responsible for the disconnection that results in visual anosognosia. Recovery of visual function occurs in some cases and may be total or partial. Complete recovery has been reported in association with hypertensive encephalopathy, cerebral hypoperfusion, and following treatment with amantadine. We present an elderly Nigerian woman (OP) with previous stroke, chronic stable cardiac failure, diabetes mellitus, and glaucoma, who defaulted in adherence to antihypertensives and suffered a catastrophic complication of severe hypertension – bilateral cortical blindness, with Anton's syndrome. Written informed consent to publish this case report was obtained from the patient's adult daughter. OP is a 64-year-old right-handed female Nigerian, a petty trader with primary school level of education, who had been on follow-up at the University of Benin Teaching Hospital's Geriatric Outpatient Clinic for stable chronic heart failure (New York Heart Association Class I) and stroke, both complications of hypertension. She also has type 2 diabetes mellitus and glaucoma and had been referred to the ophthalmologist. At a routine clinic visit recently, her blood pressure which was previously controlled was 240/140 mmHg in both supine and erect positions; random blood glucose was normal. Her adherence to prescribed medications in the 3 weeks preceding this clinic visit had been poor due to lack of funds to purchase medicines. When she and her accompanying relative were informed about the dangers of her severely elevated blood pressure and offered hospital admission, they declined despite concerted persuasion. They, however, agreed to purchase a single dose of OP's usual oral antihypertensives (all that they could afford), which OP took before their leaving the clinic. A subsequent review by the ophthalmologist confirmed cortical blindness. Her comprehensive geriatric assessment required further input from the cardiologist, geriatrician, medical social worker, neurologist, occupational therapist, and physical therapist. Cranial computerized tomography scan revealed acute bilateral occipital infarcts with extensions into the parietal and temporal lobes [Figure 1] and [Figure 2]. Baseline geriatric assessments revealed a frail woman (Fried's score 4/5), with functional impairment (modified Barthel score of 40%) and malnutrition (Mini Nutritional Assessment score 7/14). She was not depressed: Geriatric Depression Scale score (short form) was 1/15. 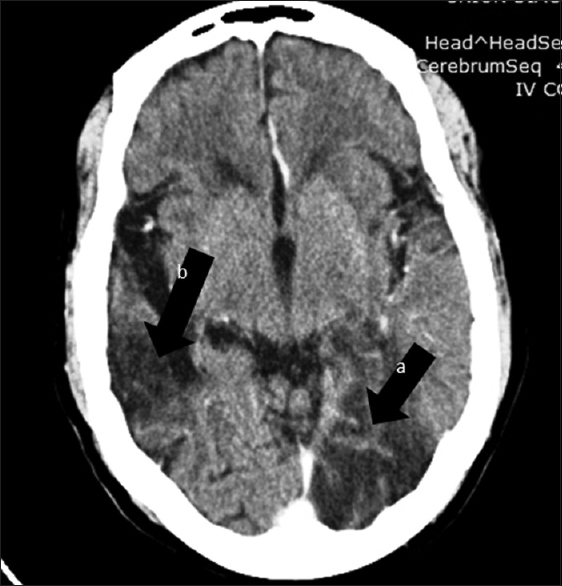 She was treated with 0.9% saline infusion and intravenous mannitol initially; soluble aspirin was added at 150 mg orally daily after the brain computed tomography excluded cerebral hemorrhage. She also had other medications for blood pressure, diabetes, and heart disease. By the 4th day of admission, OP and her relatives requested for discharge, but this was declined until a family meeting (with OP's children and members of the multidisciplinary geriatric team) was held to discuss strategies for OP's rehabilitation and continuing care (tertiary prevention). OP requires focused, multidisciplinary care with family participation. Broader social and societal interventions will also be required to mitigate the myriad complications that could arise from her recent blindness. Anton's syndrome occurring in association with bilateral cortical blindness presents special challenges because of the risks posed to patients and others when patients who are in denial of their visual impairments engage in activities that could cause themselves or others harm. A patient living in Nigeria, especially one who is elderly, frail and blind but insists that she sees and vividly (but incorrectly) describes what she sees could be labeled as having psychiatric disease. Worse still, she may be accused of witchcraft, with dire personal consequences. In either case, OP may be stigmatized, and this would come with further negative health consequences. Immediate fallouts of OP's visual loss would include enforced immobility, which if unchecked could result in worsening frailty and sarcopenia, worsening functional status, worsening malnutrition, as well as incontinence, decubitus ulcers, and depression, to name a few. OP will require nutritional, occupational, and physical rehabilitation, in addition to her routine medical care. She will also require more family support than she got before her recent blindness – emotionally, financially, physically, and psychologically. These have implications for OP and her caregivers, including the risk of caregiver burden and elder mistreatment. Judging by her medical and social history and the current economic, infrastructural, and health-care climate in Nigeria, OP's visual and functional impairment may result in disability: inability to perform basic and instrumental activities of daily living, for a start. Depending on how her visual and functional impairments are perceived by family and society and depending on what environmental modifications are possible or not, OP may also experience handicap. However, according to the World Health Organization, anatomical, physical, or psychological impairment needs not result in disability or in handicap. In the ideal world, OP would be supported to maintain an independent, functional status in spite of her visual impairment and comorbidities. However, in Nigeria, the likes of OP pay out of pocket for their entire health care, and social support is practically nonexistent. The support that OP got from her family before her becoming blind with Anton's syndrome was less than desirable. We can only hope that our efforts to institute appropriate tertiary preventative interventions (in spite of many limitations) will yield the desired result of a worthwhile quality of life for OP, despite her visual and functional impairment. Adherence to pharmacological and other interventions (secondary prevention) would have been less costly for OP and her family. The saying “an ounce of prevention is worth a pound of cure” is certainly apt in this case. Chen JJ, Chang HF, Hsu YC, Chen DL. Anton-Babinski syndrome in an old patient: A case report and literature review. Psychogeriatrics 2015;15:58-61. 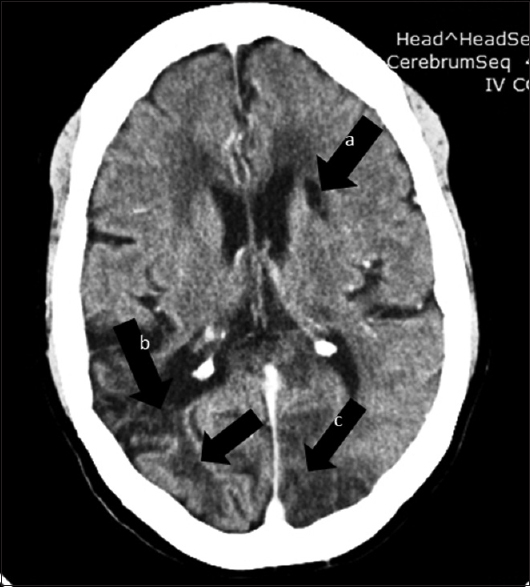 Maddula M, Lutton S, Keegan B. Anton's syndrome due to cerebrovascular disease: A case report. J Med Case Rep 2009;3:9028. Burns BT, Katner HP, Couch DA, Smith MU, Bhutta T, Stephens J, et al. Atypical presentations of progressive multifocal leukoencephalopathy (PML): Aseptic meningitis and Anton's syndrome. AIDS Patient Care STDS 1997;11:71-5. Khalid M, Hamdy M, Singh H, Kumar K, Basha A. Anton Babinski syndrome – A rare complication of cortical blindness. GMJ 2015;4:S72-6. Adeyemo BO, Nesathurai S. The original description of anton syndrome. PM R 2013;5:74. Carvajal JJ, Cárdenas AA, Pazmiño GZ, Herrera PA. Visual anosognosia (Anton-Babinski Syndrome): Report of two cases associated with ischemic cerebrovascular disease. J Behav Brain Sci 2012;2:394-8. Davis GP, Sewell RA, Levy B, Price BH, Cunningham MG. An atypical presentation of Anton syndrome in a patient with preserved cognition despite multiple cerebral infarcts: A case report. CNS Spectr 2009;14:15-8. Zukić S, Sinanović O, Zonić L, Hodžić R, Mujagić S, Smajlović E, et al. Anton's syndrome due to bilateral ischemic occipital lobe strokes. Case Rep Neurol Med 2014;2014:474952. Adeyemo BO, Howard J. A rare reversible case of Anton syndrome and the role of amantadine in management: A case report. PMR 2014;6:S107. Ajomale O. Elder Abuse: The Nigerian Experience. International Network for the Prevention of Elder Abuse; December, 2007. Available from: http://www.inpea.net/images/YinkaPaper_ElderAbuse_Nigeria_Dec07.pdf. [Last accessed on 2017 Mar 08]. World Health Organization. International Classification of Impairments, Disabilities, and Handicaps: A Manual of Classification Relating to the Consequences of Disease, Published in Accordance with Resolution WHA29.35 of the Twenty-Ninth World Health Assembly, May 1976. Geneva: World Health Organization; 1980. Available from: http://www.who.int/iris/handle/10665/41003. [Last accessed on 2017 Apr 09]. Kiel D. An ounce of prevention is worth a pound of cure: Reframing the debate about law school affirmative action. Denver Univ Law Rev 2011;88:791. Available from: http://www.law.du.edu/documents/denver-university-law-review/v88-4/kiel_toprinter_92611.pdf. [Last accessed on 2017 Apr 09].